I must admit a website is a poor approximation of the process of experiencing a painting - the internet and art do not play well together! I am not against the internet - if it were not for the net you would not be looking at this page. But there can never be a good way to experience a painting, or sculpture, or any other form of art, other than standing in front the work. I had the good fortune to see a Rembrandt exhibit in Chicago, and have never been quite the same. Even the Renoir, Bierstadt, and Monet work was overpowering in person. So why show my work on the net? Because I am able to share my work with people from all over the world and I am doing the best I can to replicate the real experience of sharing my work in the best possible presentation I can create. But as hard as I try, this is a little like describing a fine wine on the phone with a stranger. I will do my best to make this a non-internet experience. Wherever possible, I will try to give you the feeling of a gallery and try to remove you from your PC as much as possible. That is why buttons and interactive effects are at a minimum - this is not about internet technology and gimmicks, this is not about buttons that light up - it is about art! I will show some detail in some paintings just to simulate the experience of seeing an interesting painting and walking up close to the painting to sense the hand and possibly the mind of the artists. As an example, as I stood in front of a famous Rembrandt self portrait - the original - at the Art Institute of Chicago. After 30 minutes of staring at Rembrandt's portrait, I realized his eyebrows in the painting were heavily textured and the impasto/paint layers had a three dimensional effect of the thickness of his eyebrows. His face had become almost 3-D to me. The smallest of strokes with his brush had meaning and created the effect I believe he wanted. I later tried this heavy layer effect in specific places with a rose painting and gave an edge of a petal obviously visible layers of white paint tinted with red and Rembrandt was right!!! The petal stood out from the painting - almost as if I could touch the petal itself! So it is with the great artists - they are still teaching 300 years after their deaths - thank you for the quick lesson Mr. R.
I paint scenes of nature from the smallest details of flowers to the open ocean. Northern California is my home and my family history goes back in this area to 1848. One of my ancestors started a vineyard in Healdsburg in the 1860s; my grandmother taught school near Fort Ross in 1899. Her husband-to-be lived in Santa Rose and visited her home near Fort Ross traveling by rail and then horseback. Keeping in mind my hope to be as far from routine internet art presentations as possible, I will ask you to deviate a bit from the old style internet gallery process. 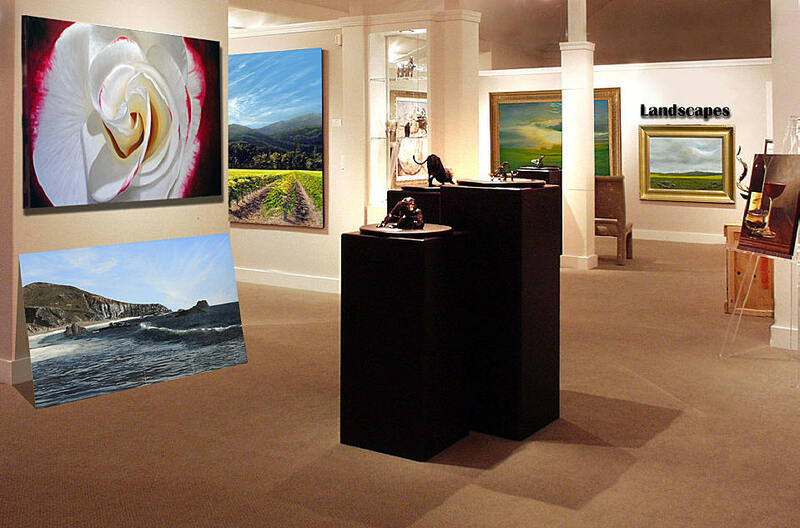 In the photo below, taken in of one of the most beautiful galleries in the Napa valley*, I have placed my paintings, here and there, for your consideration - I was represented by that gallery. If you see a particular type of painting that might be of interest to you, (landscape, vineyard, rose, etc. ), click on the painting in the photo and your browser will jump to a new page, as if you are moving to a different part of the gallery, showing many of my paintings on that subject. Clicking back from that page will return you to this main gallery image. I am not trying to be clever here, I just don't like the old standard, thumb nail image button, then click the lighted button to see the image, and the someplace on the browser page a larger image appears as a presentation. Do the best you can to pretend you are actually in a gallery looking at some paintings on the walls. 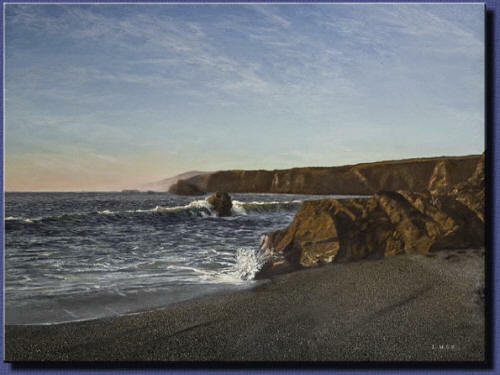 My landscapes are mostly of the Northern California area but are often universal especially the inland costal scenes. I am a realist in my style but I do experiment with reality and my fascination with light shows in both the landscapes and vineyards. One of my goals over the next year or so is to stretch reality to abstraction. By that I mean to either adapt a scene to an abstraction to simply paint a scene that is real but quite abstract in structure unless you understand the context of the scene. I will be trying some of these in the next few months and I will show the context just to show how abstract reality can be. My seascapes are simply about ocean water - the sea. I have an obsession with the complexity of water and how difficult water is to paint. I am not talking about a simple lake water scene where the water is like glass but the wild sea as it can be seen on any coast in the world in high wind or during a storm. To emphasize my point about how difficult complex water it to paint, try to think of any artist who can really paint ocean scenes well. The only painter I can think of is Winslow Homer and some of his water detail was brilliant. 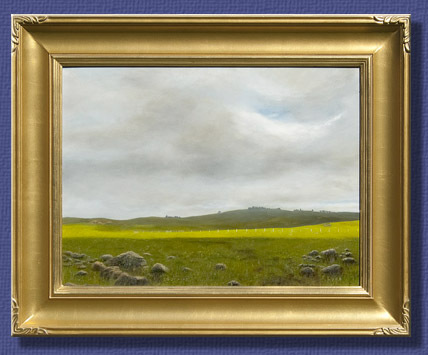 Note: By clicking on the above link "www.vineyard-paintings.com", you can visit the site, and then close the vineyard site window after your visit without closing this website you are on now (www.steveluce.com). Vineyards are a very common subject but they are also much more difficult to paint then most painters realize. I started with simple scenes in Napa Valley and very quickly found the vines themselves are much more complex then they seem. Each vine, especially in the foreground, is like a small tree. And for anyone who has taken care to paint a tree, a vineyard is hundreds if not thousands of trees. Of course the further back you look in a vineyard the more the trees blend, but the reality of a vineyard scene is that there are millions of leaves in an acre of vines. If you add to the problem, the complexity of color of vine you will soon see why vineyard are not as easy as one might think. Adding further to the complexity of the scene is the immediate foreground of miscellaneous plants and simple dirt and rocks. But as odd as it sounds, I enjoy the foreground of a vineyard painting - it seems to ground a person (so-to-speak) in their view of the vineyard. These paintings are of roses but I have plans to include iris and orchids as I explore the botanical world. I am discovering a new world of abstract forms in nature. We all know the typical still life botanical but I am finding, as I paint a rose in detail and lose context by only painting the rose, that the painting takes on a new meaning. As one views these paintings, the first impression can be abstraction, a lack of form and context. On a closer examination of the painting, one realizes that the painting is a very intimate view of a rose - a bees eye view. 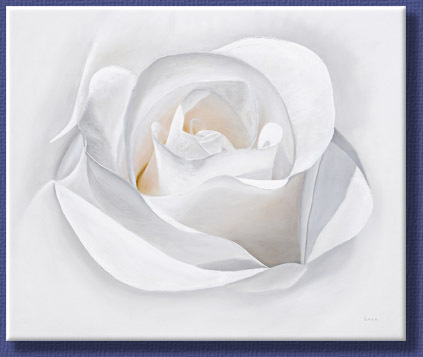 I will be painting more flowers as I explore the amazing beauty of roses and other exotic flowers of the world. I have discontinued my wine art and have moved on to new vistas but I do enjoy sharing these paintings with the wine lovers of the world. I have also included early drawings and sketches of various subjects from my earlier years in art - some as far back as the 70s. My early art page is still in development. I will post it as soon as it is ready to be viewed.